Dune is more mythos than novel and has spawned innumerable spin-off books, films and mini-series. As such, it is something of a challenge to review the original works, Dune World (1963-4) and The Prophet of Dune (1965), most commonly referred to as the amalgamated novel Dune, first published in this format in 1965 and winner of the Hugo and Nebula awards for best novel in the same year. At over 550 pages in this edition (the first hardback entry in the main SF Masterworks series, presumably for rights reasons), Dune is often lazily referred to as 'science fiction's Lord of the Rings'. There is little real merit to this analogy: yes, it is a study of good versus evil; yes, there are a number of rich and overlapping cultures portrayed in the book (the empire with its Houses and Guilds, the warped Buddhism of the Bene Gesserit 'witches', the near-eastern influences suffusing the culture of the Fremen desert tribes, the sandworms of Arrakis and the consciousness-altering spice melange drug that they make) but other than the fact that both works are engaging tales, expertly told, there is little more to say. Dune is on one level a personal, political, emotional and spiritual bildungsroman, tracing the passage of Paul Atreides, son of Duke Leto Atreides and the Lady Jessica, Bene Gesserit and concubine to the Duke, from usurped ducal heir to the Lisan al-Gaib, a prophet who will lead the native Fremen people of Dune on a program of land reclamation, turning the desert to verdure. However, to describe the novel only in these terms does a disservice to its dense and complex structure, and each reader will find a different path through it. I was particularly struck by the contemporary (i.e. mid-'60s) significance of Herbert's insistence that women (the Bene Gesserit) are covertly running the political world through their machinations, interventions, and breeding programs. To me, this seemed less to signify a progressive social emancipatory urge on the author's part than to disclose (perhaps unconsciously) a certain Cold War paranoia, with women taking the place of the Russian agents and the KGB. 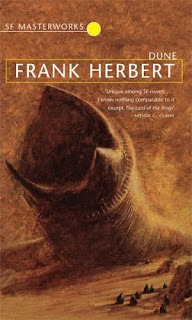 Note: Dune was the first entry in the 2001 hardback SF Masterworks series, and the seventy first entry in the numbered SF Masterworks series (cased). The same cover image was used for both editions. I came across your blog via a link on the StarShipSofa forums. From the reviews you've got here so far, I must say I'm very much looking forward to some more. I've been using the SF Masterworks list as a buying guide for quality science fiction. I like the older paperbacks, so I've been picking up old editions from second hand stores and eBay, rather than buying these reprints. There's been a couple I haven't enjoyed reading (Cities In Flight was hard going) but on the whole I don't think you can go wrong with the books in this series. Thank you for stopping by. Thanks also for introducing me to StarShipSofa. What a great site! I've literally just got back to the UK (where my SF&FMW library was in storage) after a couple of years in the USA, so expect the frequency of reviews to increase (I hope...). Next up will be David Lindsay's Voyage to Arcturus. Paul Atreides is not a bildungsroman and does not fit that definition. Rather, Paul is a superhero waiting to be awakened by the melange spice and the Water of Life. While readers may think that Paul is going through some kind of arduous maturation in the first few chapters of the book, Herbert is explicit that Paul is only a sleeper who is awakening to his destiny, to his terrible purpose. If Paul is having any trouble in any way throughout the book, it's his realization that his life leads towards becoming an Emperor who starts a bloody jihad across the universe, avenging the wrongs towards the people of Dune and Paul's noble house. This is the central core of the story that trumps anything about sand and water on the desert planet. Herbert's Dune is a classic because it's a political thriller with some great illustrations of real scientific principles. The real science within the science-fiction of Dune is political and ecological. In reference to women influencing or controlling politics, I believe that's a real phenomenon. James Clavell writes about female characters doing the same thing. Women with ambition shall always be a powerful political influence.